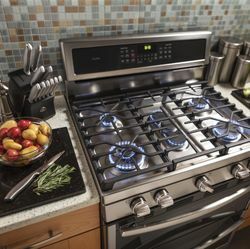 LOUISVILLE, Ky., — Jan. 20, 2015 —GE (NYSE: GE) Appliances is launching new products in a wide range of configurations for the Café™ brand. The Café line, introduced seven years ago, continues to prevail as GE’s fastest-growing brand. “The attitude toward food has been shifting for the last decade. The popularity of popping something from the freezer into the microwave is transforming into farm-to-table. 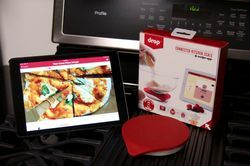 People are taking food more seriously; why wouldn’t they want their appliances to match their priorities,” says Brian McWaters, marketing executive at GE. French door wall oven: Stand closer to the oven when lifting items in and out, while maintaining distance from hot doors. Both doors open together for added convenience, especially helpful when juggling multiple cooking tasks. As a benefit for small kitchens, the French door design requires less space in front of the oven. Advantium®/wall oven combination: It’s not a standard wall oven. It’s more than a microwave. The latest microwave/wall oven combo, available in August 2015, now features GE’s most advanced cooking technology – the Advantium. It’s like having four ovens in one: Speedcook, True European Convection, microwave and warming/proofing. 36” rangetop: Get a commercial-looking kitchen with this size rangetop that wraps around your cabinets. The range offers six 18,000 BTU dual-flame stack burners and reversible grates designed to hold a wok. Induction cooktop: Induction is the fastest-growing segment in the cooktop market.1. GE has continued to invest in induction with the latest innovation inspired by smartphones. The Café induction’s controls offer Glide Touch Controls, a touch-and-swipe technology. GE also created a lightweight griddle made specifically for induction to pair with the cooktop. Sous vide accessory: GE’s sous vide device gives home chefs the tools to easily try a new cooking method. Sous vide cooks food by maintaining an accurate temperature for a long time, giving food a more velvety texture while preventing overcooking. 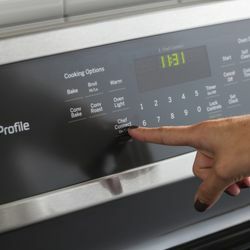 The thermometer that gauges the water bath connects to induction cooktops, which can adjust the temperature. GE is working on an app that can manage the device using a smartphone or tablet. At the heart of good appliances derives the quest for good food. The masculine design of Café echoes consumer desire for restaurant-quality food at the dining room table. Now the lineup of Café appliances will fit kitchens—whether it has standard cutouts or measurements meant for luxury.